While hearts and thoughts are tuned in to nature, volunteerism and eco-responsibility, it is an excellent time to re-explore the philosophy and work of Henry David Thoreau. Thumbing Through Thoreau: A Book of Quotations by Henry David Thoreau, written by Kenny Luck, does just that. Enhanced with interpretive illustrations from artists Jay Luke and Ren Adams, this work is one that you'll want to spend time with and share. Thoreau, a renown philosopher of the 1800's, offered society a message that was relevant in his time and even more so today: iving essentially, at the most simple level, communing with and respecting nature and finding truths through observation, experience and reflection. Slow down, look around, and pull back the curtain of your hurried life to be...simply. Some people attain legendary status for a reason. Thumbing Through Thoreau: A Book of Quotations by Henry David Thoreau looks at this nineteenth century American literary icon and how he came to be one of the most beloved minds and wits of all time. His thoughts on much of how the country and world worked at the time is still thoughtful and profound over one hundred years later. Thumbing Through Thoreau is a top pick for anyone who wants to learn the appreciate this great mind. Learn more about author Kenny Luck. 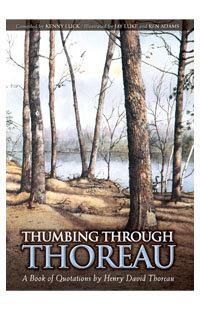 Tribute Books is offering my readers a chance to win an e-book copy of Thumbing Through Thoreau! To be eligible to enter this giveaway, you must follow That's What She Said on Google Friend Connect (mid right sidebar). This giveaway is open to all, 18+ and will end on Saturday, June 4, 2011. The winner will be selected randomly from all eligible entries and will be notified by email. The winner will have 48 hours to respond before I must move on to a runner up. Please leave your email address in your comment, in anti-spam format, if it is not available via your comment name, so I may contact you if you are the winner. To be eligible to enter this giveaway, you must follow That's What She Said via Google Friend Connect (mid right sidebar). For mandatory entry, please visit the Thumbing Through Thoreau website and leave a comment here telling me something you learned about the work, Thoreau, the author or a contributing artist. * Like author Kenny Luck, artist Jay Luke, artist Ren Adams or That's What She Said on Facebook, leave comment with FB name, 1 entry per like. * Follow Jay Luke, Ren Adams or That's What She Said on twitter, leave a comment here with your twitter name, 1 entry per follow. * Share this giveaway in some fashion - anything goes - tweet it, blog it, post to FB, Digg, Stumble. Handy share button at bottom of post. Please leave a link to your sharing in your comment. 1 entry per each sharing. * Enter any of my other active giveaways and leave comment letting me know which. 2 entries per additional giveaway. 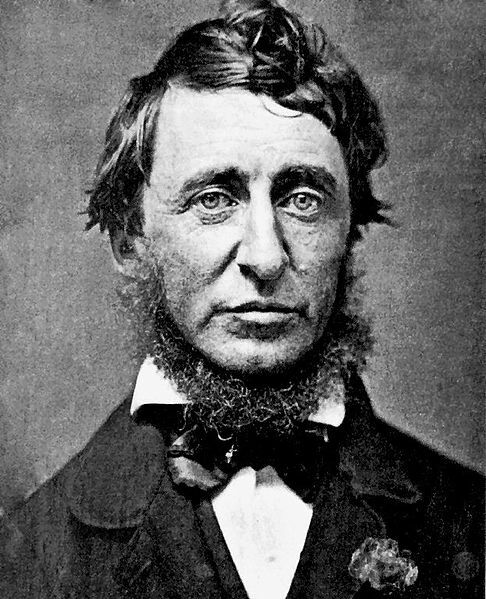 * Tell me what you love about Thoreau, or what you do to reconnect. 2 entries. CONGRATULATIONS TO...Christie, comment #13, courtesy of Random.org! On behalf of author Kenny Luck, Tribute Books and That's What She Said, thank you to all entrants for participating and following! I was provided with an ebook copy of Thumbing Through Throreau to explore for the purposes of creating this feature. Tribute books is sponsoring the prize and is responsible for shipping. Images and information taken from Thumbing Through Thoreau website. Image of Thoreau and Walden Pond sourced from Wikipedia. The opinions above are both honest and my own. Terri - thanks for the review and for hosting the giveaway. We appreciate your support in helping us get the word out about "Thumbing Through Thoreau." learned: Thoreau speaks of spiritual transcendence in Nature and the unbounded potential of the individual. I learned that Thoreau "urged that men and women ought to live more simply, and more deliberately." I didn't really know what his work was about before now. I had heard some of his quotes but that's it. I follow you on GFC. I learned that in july 4, 1845 Thoreau moved into the cabin on the shores of Walden pond.